This is an unusual form that occurs as asymmetrical runs of theta or delta activity primarily in the temporal regions, lasting for a few seconds or as long as 30-45 seconds (see the following image). Example of the psychomotor variant (rhythmic harmonic theta). This waveform is clearly a harmonic of 2 or more rhythms. The waves often have a bifid appearance. It starts suddenly on 1 side and lasts for several seconds before terminating suddenly. This behavior resembles a seizure discharge, hence the name "psychomotor variant." This waveform is recognized easily and has no pathological significance. The naive may not recognize it and assume it to be abnormal. The mu waveform occurs in the central regions in the awake patient. It is seen best if a bone defect underlies the electrodes. It can be markedly asymmetrical. It is not blocked by eye opening. It becomes obvious when the alpha disappears (ie, alpha blocking). Associated with fast activity, mu has a frequency about half that of fast activity. The most classical feature of mu waveform is that it blocks with motor activity of the contralateral body (or the thought of such movement). In these waves, the 2 frequencies are intimately intertwined and the complexes occur in bursts. They generally are thought to be clinically insignificant. 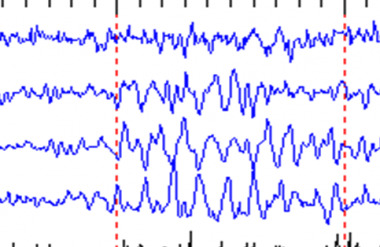 This waveform also is known as benign epileptiform transients of sleep (BETS). These sharp, small waves occur on 1 or both sides (often asynchronously), especially in the temporal and frontal regions. Rarely seen in children, they are seen most often in adults and the elderly. [7, 8] They can occur in epileptic patients but often are seen in healthy individuals. They can be regarded as a probable normal variant. These occur as bursts of miniature spike and wave complexes or runs of such complexes at 6 Hz rather than the usual 2-4 Hz. Their significance is debated, but generally those occurring in the posterior head regions are regarded as benign. The anterior variety are regarded by some as consistent with epilepsy, but further studies are needed to confirm this. They are thought to be due to harmonics of 2 or more waveforms that combine to form pseudospikes. Like wicket rhythm, they have rounded aspects to 1 side and sharp points to the other, giving the appearance of spikes or sharp waves. When these are especially large, they may appear similar to pathological spikes. However, they generally can be distinguished by their morphology and at times by their defined background rhythms, which are harmonizing. They can be seen either in wakefulness or sleep in the anterior or temporal head regions. 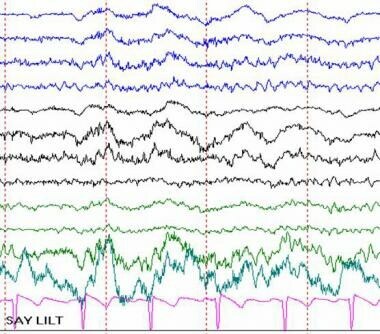 The typical pattern of subclinical rhythmic EEG discharges in adults (SREDA) consists of theta rhythm occurring in a widespread manner, maximal over the parietal and posterior temporal regions, and lasting for a few seconds to a minute without clinical signs or symptoms. It is described as "not evolving" and appears quite stable for its duration. Another unusual variant is made up of predominantly delta frequencies as well as notched waveforms with a frontal distribution and a more prolonged duration that even includes sleep. No significant clinical differences have been found between groups that had the atypical pattern and those with the typical pattern. Forehead, jaw, and eyelid muscle movements can cause artifacts by moving the electrodes. Movements in the surroundings produce disturbances by altering the ambient electrical fields. Moreover, the tongue and eyes have their own dipole electric charge. Therefore, their movement can get recorded by the electrodes. This, in turn, can affect the recorded brain wave. Artifact produced by tongue movement. The person was asked to say LILT, which caused the waves to slightly undulate. EEG artifact of eye blinking. ECG may contaminate the recording. Sweating produces electrical disturbances by shorting electrode pairs. Other sources of artifacts include ambient electrical waves from respirators, intravenous pump machines, televisions, and other electrical equipment. Many are recognized by their characteristic appearance on the tracing, but others are identified by direct inspection and reported by the technologist or identified on the video tracing in video-EEG recording. Artifacts show great variation because of their protean origin. They may be single waves or recurrent waves (eg, intravenous infusion running), while others are prolonged disturbances (eg, sweating). The specifics of each are not reviewed here because of their variability. Chewing produces spurious spike and wave runs in the frontal and temporal regions from the temporalis muscles (see image below). 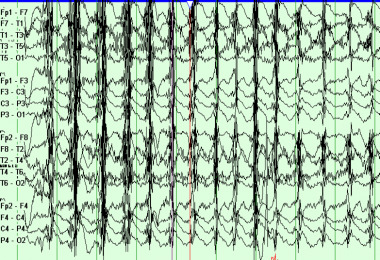 Example of EEG chewing artifact. Sweating produces very slow waves, because the salt solution shorts out pairs of adjacent electrodes. Eye movements occur with blinking and result from the electrical charge of the eye itself (see image below). They are frontal. Nystagmus also produces artifactual waves. ECG and pulse motion produce unusual waveforms. ECG produces small spikes that are recurrent and are especially evident in the monopolar montages. Pulse artifacts occur with recurrent motion of electrodes sitting over a bounding pulse, which alters the contact with the skin. This causes a rhythmic disturbance that is synchronous with the heart but rounded rather than sharp in form. Tremor and movement of the head or body may cause electrodes to move. Electrode pops or movements can produce sudden, recurrent, or continuous electrical waves. Electrical fields result from electrical devices and televisions. ICU special waveforms may result from respirator-induced movements, intravenous drips and drip pumps, electrical fields, or cautery (eg, Bovie) in the operating room or emergency department. EEG is a complex summation of many frequencies. Different frequencies sometimes add to or cancel each other, creating odd waveforms or fluctuations of waveforms. Pseudospikes or pseudoslow waves may be seen with intermixing of waves. Many fascinating patterns have been generated by mixing artificially created computer-generated frequencies. These waveforms have the significance of the basic waveforms that underlie the patterns. What are normal EEG variants? What are psychomotor EEG variants? What are mu EEG variants? What are 14- and 6-Hz EEG variant waves? 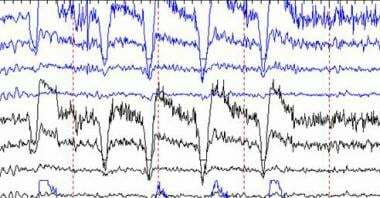 What are small sharp spikes of sleep (SSS) EEG variants? What are 6-Hz spike and wave (phantom spike and wave) EEG variants? What are wicket spikes EEG variants? What are subclinical rhythmic EEG discharges in adults? What are rhythmic midline theta EEG variants? What are the harmonics of EEG? Niedermeyer E, Lopes da Silva F. Electroencephalography: Basic Principles, Clinical Applications, and Related Fields. 5th ed. 1993. Fisch B. Fisch and Spehlmann's EEG Primer. 3rd ed. Amsterdam: Elsevier; 1999. Ioannides AA, Poghosyan V, Dammers J, Streit M. Real-time neural activity and connectivity in healthy individuals and schizophrenia patients. Neuroimage. 2004 Oct. 23(2):473-82. [Medline]. Azzam R, Bhatt AB. Mimickers of generalized spike and wave discharges. Neurodiagn J. 2014 Jun. 54 (2):156-62. [Medline]. Berenguer-Sanchez MJ, Gutierrez-Manjarrez F, Senties-Madrid H, Estanol-Vidal B. [Electroencephalographic normal variants or with uncertain significance]. Rev Neurol. 2012 Apr 1. 54 (7):435-44. [Medline]. Blume WT, Kaibara M. Atlas of Pediatric Electroencephalography. 2nd ed. Philadelphia: Lippincott-Raven; 1999. Stern JM, Engel J. An Atlas of EEG Patterns. Philadelphia: Lippincott Williiam & Wilkins; 2004. Brenner R. EEG on DVD: Adult. 1st ed. Demos Medical Publishing; 2007. Urigüen JA, Garcia-Zapirain B. EEG artifact removal-state-of-the-art and guidelines. J Neural Eng. 2015 Jun. 12 (3):031001. [Medline]. Johns Hopkins. Pacemakers for the brain. Johns Hopkins Med Lett Health After 50. 2004 Sep. 17(7):1-2. [Medline].